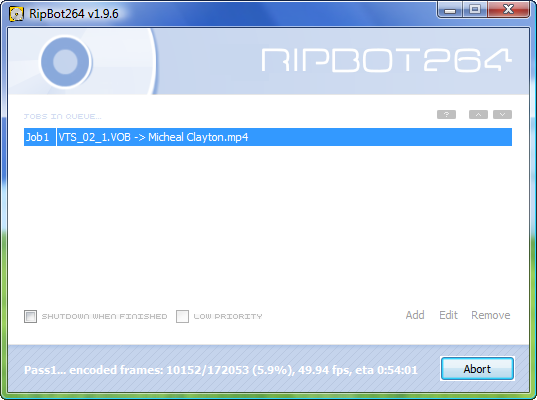 This is a guide for encoding your DVD (Blu-ray will work too) movies into H.264 using Ripbot264 a very nice encoder that uses x264. The target being high quality & playback via device (PS3/X360 etc) on an LCD HDTV running at 720p or higher. Step 2: Extract the files to a folder and run Ripbot264. You will be presented with a window like the one below. 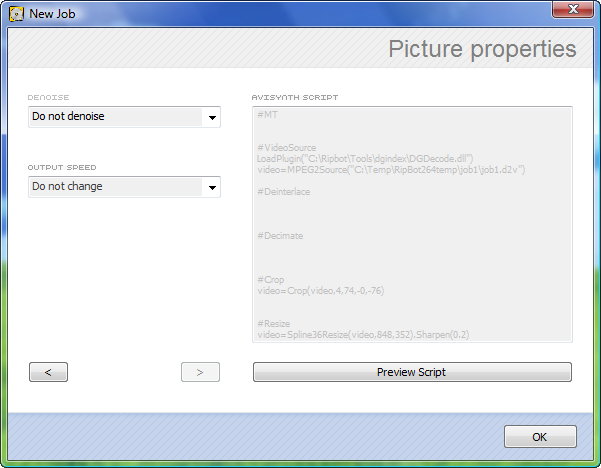 This screen allows you to add, edit and remove jobs so click on Add to begin. I'm going to assume that you already have ripped your DVD to your hard drive if not then go use AnyDVD or some other ripper to do it. 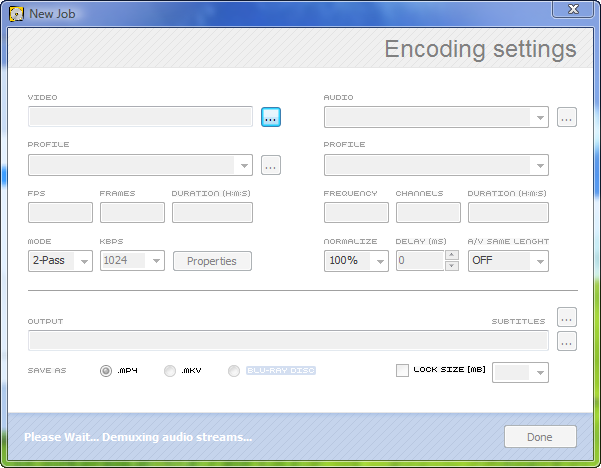 Step 3: On this screen we see the main options but nothing is yet available. Click on the highlighted button to input your movie. Step 4: Now browse to locate your DVD folder and point it at the first VOB file of the movie (switching to details view mode helps here, see highlighted button), Ripbot will automatically pick up the other parts and find the movie so if all goes well it will display "demuxing audio streams". The demux can take some time so be patient and after it is done we can proceed. Step 5: The next step is to change a few settings so we can get the optimal quality (though this is by no means definitive just my own personal observations). First up under output at the bottom of the screen you will see MP4, MKV or Blu-ray disc as a selection for compatibility with the Xbox 360 and PS3 select MP4. 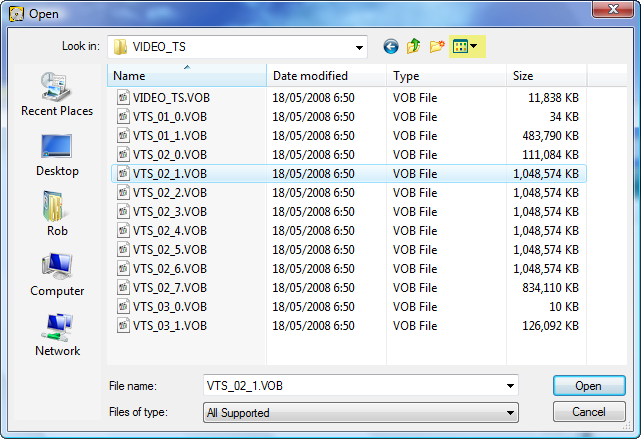 If you want AC3 5.1 audio select Blu-ray disc then look in the BDMV\STREAM folder and you will find an M2TS file known as AVCHD that you can use with your Playstation 3. 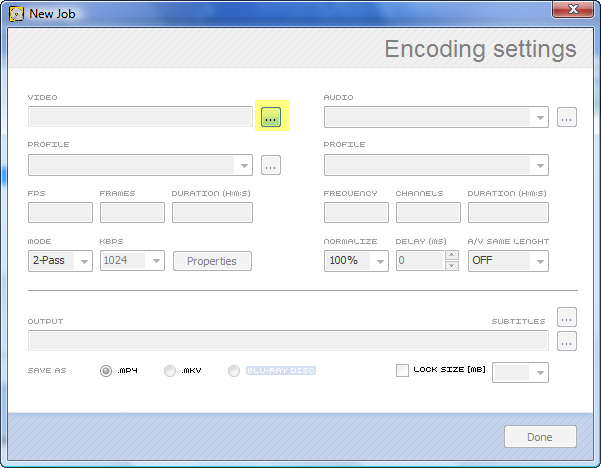 See where it says mode = CQ change that to a value of 18, the constant quality mode gives a fast encode and high quality video. The higher the value the more compression the lower the value the less compression from the accounts of others with it set at 18 most movies should be close in quality to the original source material. If you are not happy with the results you can always lower the value. Just be aware that the CQ mode has no fixed file size and depending on the type of video the file size can vary greatly for example Michael Clayton turned out at 1GB for what is a 7.7GB DVD and Downfall turned out at 3GB for what is a 7.2GB DVD. For whatever reason the Michael Clayton movie was much more susceptible to compression than the Downfall movie was, if the movie goes over 4GB it will not play on the PS3 so you will need to redo the movie, try a setting of 20-22 & that may bring it under 4GB. 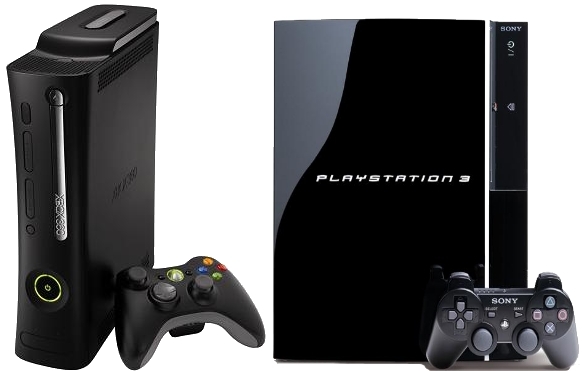 The 4GB limitation only applies to the PS3 and MP4 containers, the Xbox has no limit and the PS3 has no limit for AVCHD/M2TS files either, going over 4GB is only best suited if you plan on streaming media over network as 4GB limit applies to any USB HD plugged in to either console. The next option on the cards is the audio, pretty much leave it at the 128k AAC LC 2.0 (stereo), the Xbox 360 only supports AAC LC anyway. The PS3 can use the AAC 5.1 options at higher bitrates so if the PS3 is your target select one of those instead. If you are after an AVCHD video for the PS3 then it will change to copy mode for the audio if it is already in the AC3 format. For the save file location pick any folder, don't use the default root of C: as Windows Vista will not allow you to write a file to that location for security reasons. 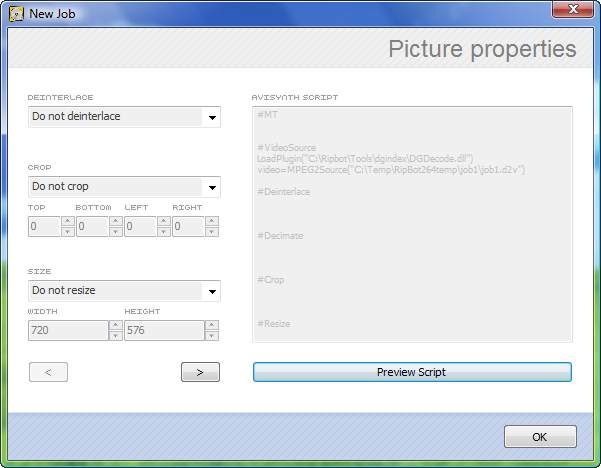 Step 6: Now click on properties button as shown in the screen below, this will bring us to the cropping, resizing, de-interlace section. 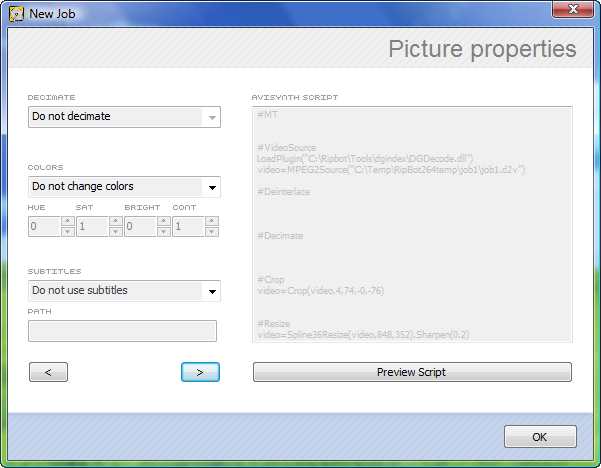 The cropping feature will remove the black bars/borders from the movie. 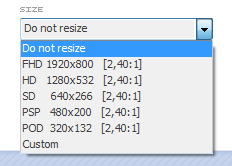 You don't actually need to crop movies when using x264 there is no penalty, it also makes things easier if you simply want your movie to look like the original DVD and just use a custom resize to 1024x480 (NTSC) or 1024x576 (PAL). If you do want to crop the auto crop tool generally does a good job at what needs to be cropped and what doesn't so don't worry about it too much. If you have cropped the video then select resize and it will display the aspect ratio which may or may not have been adjusted after taking cropping into account. Ripbot264 comes with built in selections for common resolutions, you can also choose custom mode but for that I would recommend if cropping is using the aspect ratio calculator to get the right resolution so the movie wont be pulled or stretched in the wrong way and look really weird when played back (the aspect ratio of the movie is the [2,40:1] in the screen below). On the last screen you have the denoise option, the denoise should only be used on really bad movies that are poor VHS transfers or really poor quality TV shows etc, the other setting should be (left alone). Step 8: So with everything setup to our liking click ok & we're back to the main screen, all that is left is to click on "done". You will be brought back to the first screen which now shows your queued job, from where you can click on add again to add another job or edit to change anything with the selected job. Once happy click start and it will work it's magic. Completed jobs are auto removed when you close the program. Overall it's a pretty straightforward once you have done it once or twice. As for time to encode well that depends on your computer, I'm running a quad Intel core 2 @ 2.94GHz so that's pretty high end, on average it takes about 1 hours 40 mins to do a movie which is pretty fast so you can do a lot in one day.